Oil hit its highest in more than three weeks on Monday, topping $52 a barrel after Saudi Arabia and Russia said that supply cuts need to last into 2018, a step towards extending an OPEC-led deal to support prices for longer than first agreed. Global benchmark Brent crude was up $1.45 at $52.29 a barrel by 1405 GMT (10.05 a.m. ET), having touched $52.63, the highest since April 21. U.S. crude rose by $1.46 to $49.30. 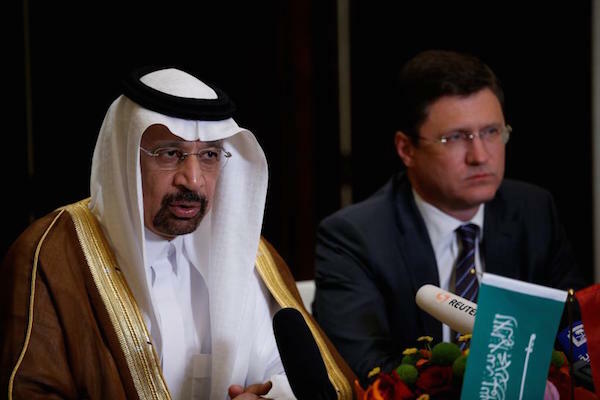 Oil traders were surprised by the strong wording of the announcement, though it remained to be seen whether all countries participating in the deal would agree with the Saudi-Russian stance. Some analysts doubted that producers would stick to a prolonged curb. “Extending the cuts until March 2018 would take account of the fact that demand in the first quarter of a year is lowest for seasonal reasons,” said Commerxbank analyst Carsten Fritsch. The Organization of the Petroleum Exporting Countries, Russia and other producers originally agreed to cut output by 1.8 million barrels per day in the first half of 2017, with a possible six-month extension. Oil has gained support from the deal but inventories remain high and rising output from other producers, such as the United States, is keeping prices below the $60 that top exporter Saudi Arabia would like. The ministers said they hoped other producers would join the cut, which would initially be on the same volume terms as before. Kazakhstan, however, said it could not join a prolonged reduction on the same terms. “When the two biggest oil producers of the world reach a consensus on the extension of a supply cut, the market will listen,” Tamas Varga, of oil broker PVM, said in a report. Ministers from OPEC and non-OPEC countries meet to decide policy on May 25 in Vienna. Two small producers not involved in the original deal, Egypt and Turkmenistan, have also been invited.